Unions all over the world are trying to anticipate the agreement’s likely impacts and navigate its provisions to advance the interests of working people. Towards that end, a cross section of international labor will be in Marrakech from November 7th-19th calling for a “just transition strategy,” and to press for more ambitious targets and adequate climate financing for the global South. The ITUC’s goals have broad support across the international labor community. In recent days a group of rank and file union members launched Labor for Standing Rock (LSR) and supporters of the group traveled to the Standing Rock Reservation in North Dakota. Registered nurse and UFCW member Cliff Willmeng sent this “there are no jobs on a dead planet” video message on the importance of the DAPL struggle to the fight to protect the climate. Stopping the expansion of fossil fuel use and infrastructure is a top priority, and not just for climate-related reasons. 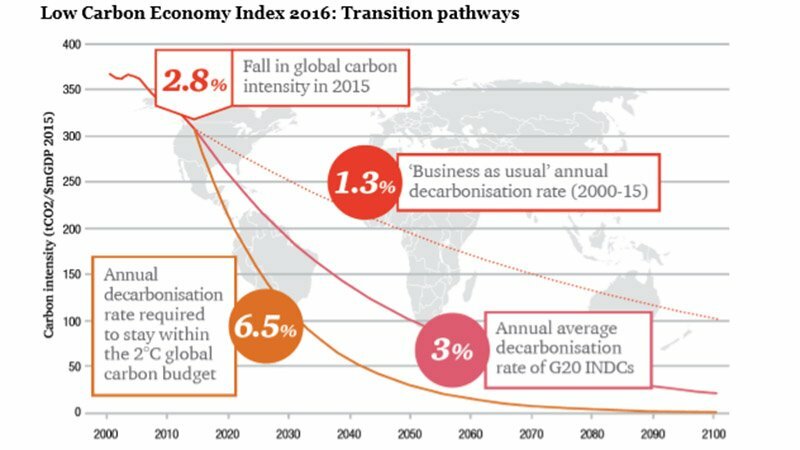 But, as the ITUC notes, “staying well below 2°C in average temperature increase, and aiming at 1.5°C”, will only be reached if concrete measures are taken to dramatically change our production and consumption patterns.” In late October 2016, Price Waterhouse Coopers’ (PWC) annual Low Carbon Economy Index reported that “carbon intensity” needs to fall at a rate of 6.5% a year, every year, until 2050 in order to stay within 2 degrees Celsius. In 2013, the same report concluded a 5.1% annual reduction was necessary over the same period, and declared then that the 2 degree Celsius target was “ highly unrealistic.” If it was highly unrealistic then, it has clearly not gotten more realistic since. Given the urgency of the situation, it is unfortunate that the ITUC statement for COP22 uses unclear and ambiguous language about what an energy transition should entail. It states that, “Universal access and democratisation of energy is needed if we are to achieve ambitious climate action…. Energy companies need to be restructured in order to allow for such democratic involvement of those affected and public oversight, including that of workers’ participation.” It is not clear what “restructured” means in this context, and “public oversight” is clearly not the same as public ownership. 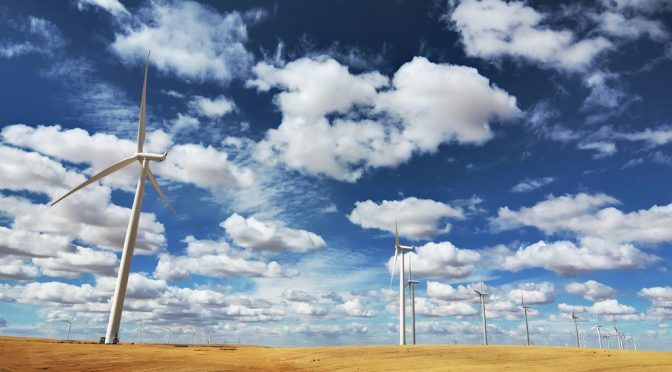 At COP20 in Lima in 2014, unions involved with TUED were successful in having a clearer commitment to public ownership included in the ITUC’s statement, which argued, “Democratic ownership of energy is needed if we are to achieve ambitious climate action. Energy, along with other common goods that belong to humanity (air, water), must be brought, administered and kept under public control.” This language was consistent with the resolution passed at the large Rio+20 trade union conference on climate change in June 2012. The ITUC statement is strong in many key areas, but as a movement we cannot afford to be ambiguous about the need to struggle for full democratic control over global energy systems. This is necessary in order to drive public renewable power at the speed and scale required. In the energy sector, it is hard to imagine how a “just transition” can be achieved without a shift towards public ownership. As difficult as it will be to make this shift actually occur, it pales in comparison to the challenge posed by the “well below 2 degrees” and “net zero emissions” targets that lie at the heart of the Paris Agreement. 2 See: Amalgamated Transit Union ; California Faculty Association; Communications Workers of America ; Industrial Workers of the World; IWW Environmental Unionism Caucus; National Nurses United ; New York State Nurses Association; National Writers Union/UAW Local 1981; United Electrical Workers ; SEIU 503 OPEU; Border Agricultural Workers ; and the Labor Coalition for Community Action , which includes the A. Phillip Randolph Institute, the Asian Pacific American Labor Alliance, the Coalition of Black Trade Unionists, the Coalition of Labor Union Women, the Labor Council for Latin American Advancement, and Pride at Work.